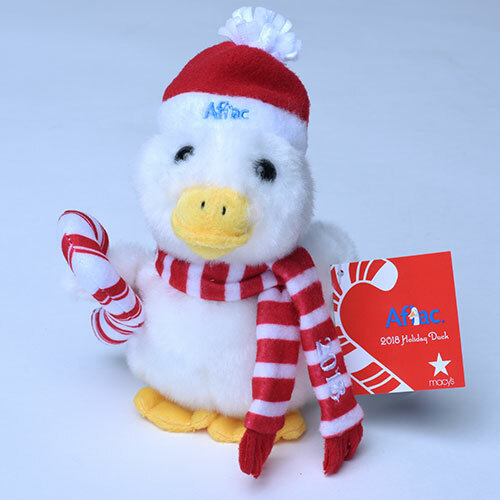 This year’s limited-edition plush features the Aflac Duck wearing a warm red hat topped by a fluffy pompom and wrapped in a red and white striped scarf while holding a bright candy cane in his wings. This annual collectable also sports an embroidered 2018 on its scarf, and an Aflac logo on its cap. The festive little duck, available in six- and 10-inch versions, is ready to keep you warm on cold winter nights. It will even quack a little “Aflac” to you when squeezed. Constructed of top-quality plush materials for durability and softness. Includes small parts. For children ages 3+. 100% of the net proceeds from the purchase of this item go to the Aflac Foundation, Inc. to help children with cancer across the country. © 2018 Aflac Incorporated. All rights reserved.